A heavy rainstorm washed over the Russian capital on Friday, prompting an extreme weather warning, sending torrents of water rushing down the city’s streets, and blowing up a gas station with lightning. After a warm muggy Friday afternoon, the sky above Moscow suddenly darkened, sending the city into twilight. Soon after, the clouds erupted in a powerful thunderstorm. The thunderstorm was accompanied by winds of up to 38 miles per hour (17 meters per second), fresh breeze to fresh gale by international standards. Forecasts say the rainy weather will continue through the night and into Saturday. 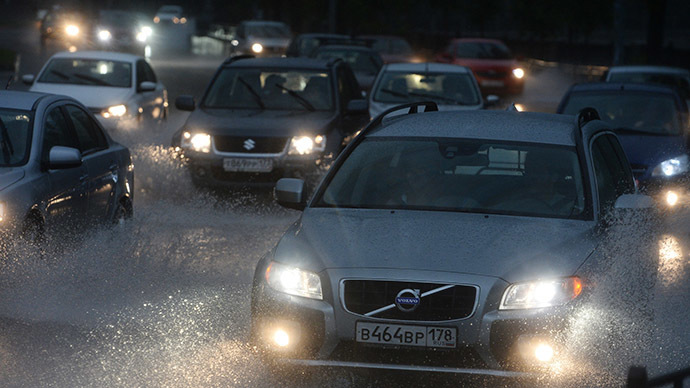 Part of Moscow’s Profsoyuznaya Street was flooded in the deluge. Some drivers were forced to push their half-submerged cars while nearly being washed away by the wake created by drivers lucky enough to keep driving. ...Some almost had to swim home. Communal services say that 90 streets in total were partially flooded. The thunderstorm caused actual destruction as well. An explosion sparked by a lightning strike shook a local petrol station during the storm, according to witnesses. The blast also shattered windows in nearby buildings and started a fire. No casualties have been reported. The fire was extinguished, and emergency service workers confirmed that lightning had caused the blaze.